Aim: This study investigated the effect of one hemostatic agent on the shear bond strength of self-etch and etch-and-rinse adhesive systems. Materials and Methods: Sixty extracted third molars were selected. After preparing a flat surface of superficial dentin, they were randomly divided into six groups. Adhesives were Tetric N-Bond, AdheSE, and AdheSE One F. Before applying adhesives, surfaces were contaminated with ViscoStat for 60 s in three groups and rinsed. Then composite were attached to surfaces and light cured. After thermocycling, the bond strength was calculated and failure modes were determined by stereomicroscope. The data were analyzed by t-test and one-way ANOVA with P < 0.05 as the level of significance. Results: ViscoStat had significantly decreased the shear bond strength of AdheSE (P < 0.0001) to dentin. Modes of failures in all groups were mainly adhesive. Conclusion: Contamination had an adverse effect on the shear bond strength of AdheSE and reduced it. By hemostatic agents' application, smear layer was removed or some change in dentin surface happened that could affect the hybrid layer quality after the self-etch or etch-and-rinse adhesives usage. Contamination prevented penetration of adhesives into dentin surface and ultimately affect bond strength. Therefore, the efficacy of self-etch and etch-and-rinse adhesive systems should be considered first and then recommended for clinical uses. This study evaluated the shear bond strength of one etch-and-rinse and two self-etch adhesives to human dentin contaminated with a ferric sulfate hemostatic agent. The null hypothesis of this study was that contamination with ferric sulfate 20% may not have any effect on shear bond strength of etch-and-rinse and self-etch adhesive systems to dentin. In this in vitro experimental study, 60 intact caries-free human third molars were selected and cleaned up of soft tissues. Then, they were stored in a 0.5% Chloramine-T (Fisher Chemical, Fair Lawn, NJ, USA) solution for 24 h. After they were rinsed, about 1.5-2 mm of buccal or lingual tooth structure (enamel and dentin) were removed by using a diamond bur (SS White, Great White Series, Lakewood, NJ, USA) to create flat surfaces of superficial dentin for testing (each bur was discarded after each five preparation). Dentin surfaces were ground with 400 and 600 grit sand paper under running water to produce a standardized smear layer. Teeth were mounted in self-cure acrylic resin. The samples were randomly assigned to six groups. Materials were used according to the manufacturers' instructions. Group 6: No ViscoStat application was done. AdheSE One F bonding system was used same as in group 5. AdheSE One FAdheSE One FA plastic mold (2 mm in internal diameter and 4 mm in height) were used to prepare the composite (Tetric N-Ceram, Ivoclar/Vivadent, Schaan, Liechtenstein) cylinders on dentin surfaces. Composite were placed in two increments and each increment was light cured for 40 s. All samples were stored in distilled water for 24 h at room temperature, then were thermocycled for 500 cycles between 5°C and 55°C (with a 60 s dwell time and a 15 s transfer time). The shear bond test was done using a Universal Testing Machine (M350-10CT Testometric, Lancashire, United Kingdom) at a cross head speed of 0.5 mm/min. The shear bond strength was calculated in mega Pascal (MPa). Two examiners evaluated the debonded surfaces at × 40 magnifications by using a stereomicroscope (Olympus, DP 12, Germany) to identify the mode of bond failure whether adhesive, cohesive or mixed. Statistical analysis was done using one-way ANOVA and unpaired t-test with P < 0.05 as the level of significance. Mean and standard deviation values of shear bond strength test are shown in [Table 1]. In comparison with case and control groups, only there was statistically significant reduction in the shear bond strength value in AdheSE groups (P < 0.0001). In Tetric N-Bond and AdheSE One F there was no significant reduction in shear bond strength. In comparison with ViscoStat applied groups, there were statistically significant differences among all groups. Tetric N-Bond had the highest (P < 0.0001) and AdheSE One F had the lowest (P < 0.0001) shear bond strength value. The same results were seen in comparison among groups where ViscoStat was not applied. Modes of failures are seen in [Table 2]. Kimmes et al. study showed that rinsing contaminated dentin surfaces with ViscoStat and ViscoStat Plus after blood contamination did not alter shear bond strength of Optibond Solo Plus (Kerr, Orange, CA, USA) to dentin. A study of Harnirattisin et al. has shown that there were no differences in dentinal content between aluminum chloride (a hemostatic agent) contaminated dentin and non-contaminated one after acid etching. In AdheSE groups, results showed that rinsing ViscoStat, alone, cannot eliminate surfaces contamination and thus the remnant ferric sulfate interfered with diffusion of AdheSE in dentinal tubules and reduce shear bond strength significantly. O'Keefe et al. study showed that rinsing ferric sulfate and aluminum chloride hemostatic agents with water before using self-etch adhesives causes higher bond strength than non-rinsing ones. The differences in depth of penetration in dentin (AdheSE: 1.2-2.2 μ , AdheSE One F: 0.05 μ ) could explain the differences of their bond strength, which resulted from this study. All these problems can explain lower bond strength in AdheSE One F group in comparison with AdheSE and these findings were in agreement with Grégoire et al. and Knobloch et al. studies. According to Mousavinasab and Kavian  study, one-bottle adhesive (such as AdheSE One F) had a very thin hybrid layer where polymerization may be damaged because of the oxygen inhibiting layer formation. Some self-etch adhesives could not diffuse through smear layer because of their weak acidity in which they buffered with smear layer, enamel and dentin. Buffered primer or adhesive had lower penetration. Tooth demineralization with self-etch adhesives has contrary with tooth buffering capacity and these adhesives could show different behavior. AdheSE One F was one of the new presented products, which had an unknown behavior in adhesion. According to Proença et al. study in 2009, lower degree of conversion of self-etch adhesive and water trees builds up (pertain to water diffusion from underlying dentin to hybrid layer) was the main reason of lower bond strength of self-etch adhesive in comparison with etch-and-rinse adhesives. If bond strength to dentin or enamel was more than 20 MPa, mode of failure dominantly happened cohesively in tooth structure or composite. In this study, cohesive failure was seen in etch-and-rinse groups more than self-etch groups. Indeed, the higher bond strength in control groups showed the lower adhesive failures. Within the limitations of this study, it can be concluded that dentin contamination with ViscoStat hemostatic agent had an adverse effect on the shear bond strength of two-step self-etch adhesive, AdheSE, and reduced it. This study was resulted from a student thesis which supported by Kerman University of Medical Sciences. The authors thank Kerman University of Medical Sciences and Kerman oral and dental diseases research center for financial support and Dr. Jahani for statistical analysis. 1. Kaneshima T, Yatani H, Kasai T, Watanabe EK, Yamashita A. The influence of blood contamination on bond strengths between dentin and an adhesive resin cement. Oper Dent 2000;25:195-201. 2. Cenci MS, Pereira-Cenci T, Donassollo TA, Sommer L, Strapasson A, Demarco FF. Influence of thermal stress on marginal integrity of restorative materials. J Appl Oral Sci 2008;16:106-10. 3. Abdalla AI, Davidson CL. Bonding efficiency and interfacial morphology of one-bottle adhesives to contaminated dentin surfaces. Am J Dent 1998;11:281-5. 4. Xie J, Powers JM, McGuckin RS. In vitro bond strength of two adhesives to enamel and dentin under normal and contaminated conditions. Dent Mater 1993;9:295-9. 5. Carvalho RM, Carrilho MR de O, Pereira LCG, Garcia FCP, Marquesini L Jr, Silva SM de A, et al. Adhesive systems: Foundations for the comprehension of its application and clinical performance. Bio Odonto Dent Estet 2004;2:9-86. 6. Harnirattisai C, Kuphasuk W, Senawongse P, Tagami J. Bond strengths of resin cements to astringent-contaminated dentin. Oper Dent 2009;34:415-22. 7. Prabhakar AR, Bedi S. Effect of glutaraldehyde and ferric sulfate on shear bond strength of adhesives to primary dentin. J Indian Soc Pedod Prev Dent 2008;26:S109-13. 8. Fischer DE. Tissue management needs for adhesive dentistry now and in the future. Dent Clin North Am 1998;42:595-606. 9. Kimmes NS, Olson TL, Shaddy RS, Latta MA. Effect of ViscoStat and ViscoStat Plus on composite shear bond strength in the presence and absence of blood. J Adhes Dent 2006;8:363-6. 10. Ayo-Yusuf OA, Driessen CH, Botha AJ. SEM-EDX study of prepared human dentine surfaces exposed to gingival retraction fluids. J Dent 2005;33:731-9. 11. el-Kalla IH, García-Godoy F. Saliva contamination and bond strength of single-bottle adhesives to enamel and dentin. Am J Dent 1997;10:83-7. 12. Kuphasuk W, Harnirattisai C, Senawongse P, Tagami J. 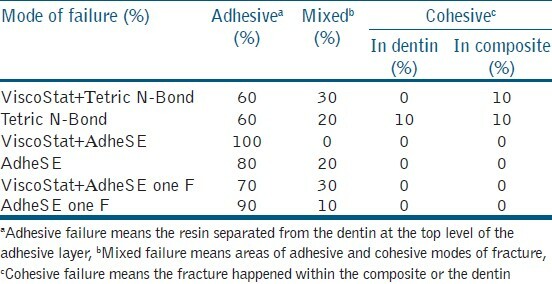 Bond strengths of two adhesive systems to dentin contaminated with a hemostatic agent. Oper Dent 2007;32:399-405. 13. O'Keefe KL, Pinzon LM, Rivera B, Powers JM. Bond strength of composite to astringent-contaminated dentin using self-etching adhesives. Am J Dent 2005;18:168-72. 14. Margvelashvili M, Goracci C, Beloica M, Papacchini F, Ferrari M. In vitro evaluation of bonding effectiveness to dentin of all-in-one adhesives. J Dent 2010;38:106-12. 15. Land MF, Couri CC, Johnston WM. Smear layer instability caused by hemostatic agents. J Prosthet Dent 1996;76:477-82. 16. Catel Y, Degrange M, Pluart LL, Madec PJ, Pham TN, Chen F, et al. Synthesis, photopolymerization, and adhesive properties of new bisphosphonic acid monomers for dental application. J Polym Sci A Polym Chem 2009;47:5258-71. 17. Grégoire G, Dabsie F, Dieng-Sarr F, Akon B, Sharrock P. Solvent composition of one-step self-etch adhesives and dentine wettability. J Dent 2011;39:30-9. 18. Aguilar-Mendoza JA, Rosales-Leal JI, Rodríguez-Valverde MA, Cabrerizo-Vílchez MA. Effect of acid etching on dentin wettability and roughness: Self-etching primers versus phosphoric acid. J Biomed Mater Res B Appl Biomater 2008;84:277-85. 19. Bayrak S, Tunç ES, Saroðlu I, Eðilmez T. Shear bond strengths of different adhesive systems to white mineral trioxide aggregate. Dent Mater J 2009;28:62-7. 20. Knobloch LA, Gailey D, Azer S, Johnston WM, Clelland N, Kerby RE. Bond strengths of one- and two-step self-etch adhesive systems. J Prosthet Dent 2007;97:216-22. 21. Gallo JR, Comeaux R, Haines B, Xu X, Burgess JO. Shear bond strength of four filled dentin bonding systems. Oper Dent 2001;26:44-7. 22. Mousavinasab SM, Kavian M. The effect of one versus two application of self-etch primers on micro-shear bond strength to the enamel and dentin. Shiraz Univ Dent J 2009;9:319-25. 23. Kaviani A, Zarepoor K. Experimental comparison of shear bond strength of a self-etch adhesive system by three dentin conditioning methods. Sci Med J 2009;8:56-61. 24. Proença JP, Polido M, Osorio E, Erhardt MC, Aguilera FS, García-Godoy F, et al. Dentin regional bond strength of self-etch and total-etch adhesive systems. Dent Mater 2007;23:1542-8. 25. Bouillaguet S, Gysi P, Wataha JC, Ciucchi B, Cattani M, Godin C, et al. Bond strength of composite to dentin using conventional, one-step, and self-etching adhesive systems. J Dent 2001;29:55-61.